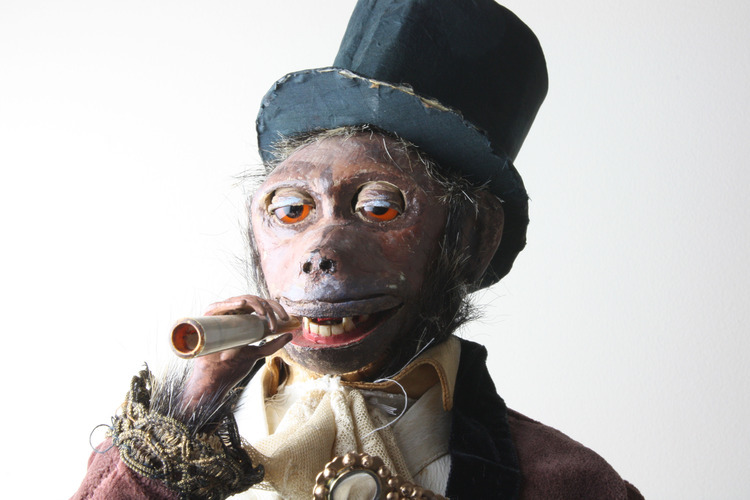 When a lit cigarette is placed into the holder and the automaton wound with the captive thumb-grip Vichy key stamped GV and start/stop knob actuated, the fully evening-dressed standing primate begins his enchanting performance, with his head nodding up, down and diagonal action to merge to a sideways motion, he raises his ocular panz-nez to left eye held in left hand, all the while blinking both eye lids and opening and closing mouth. 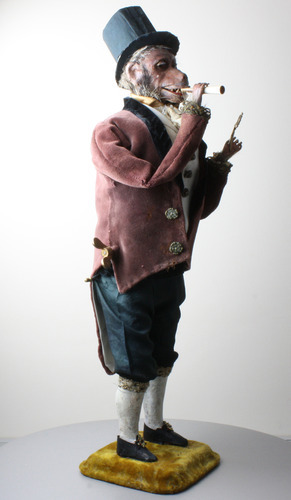 He raises right hand with the cigarette holder to mouth, takes three pulls and lowers holder halfway to exhale slowly in pulses as head turns slightly and nods, then raises again his holder for two pulls, before taking a further four pulls, lowering holder and exhaling once more in pulses as his eye lids blink, his head nods and moves most realistically surrounded with the cloud of cigarette smoke emanating, coming to a stop once the cigarette has burnt down or start/stop has been actuated. 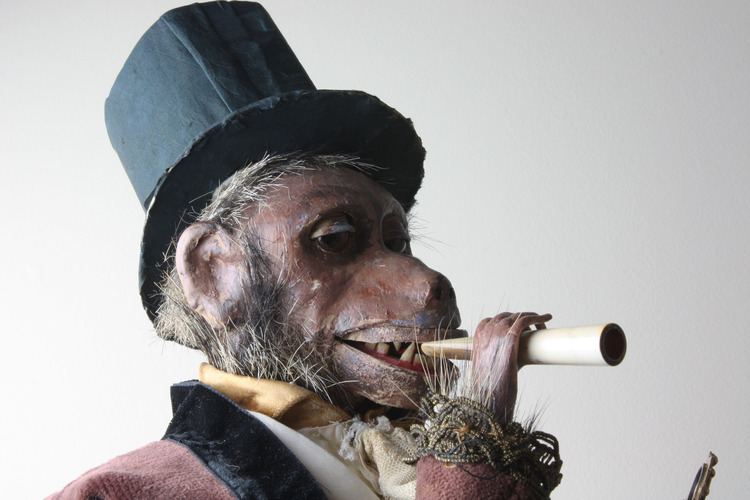 The standing monkey in gentleman's evening dress attire, with painted papier-mâché head, leathered jaw and eye lids, brown glass eyes, grasping hands and fingers, the cigarette holder of tapering and shaped bone. 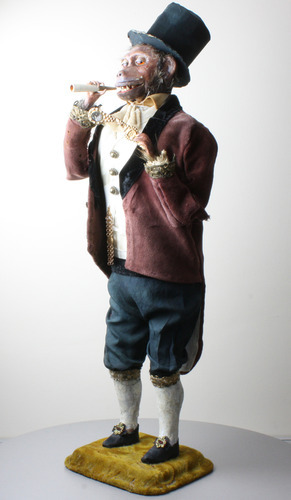 Wearing black top hat, stiff-collared shirt with ruffed white lace cravat, cream waistcoat having watch chain and triple gilt roundel buttons, and three-quarter length red velvet smoking jacket with low tail and black velvet lapels, gold strand cuffs with the lace shirt cuffs behind, black silk breaches with matching gold strand hems, and integral off-white stockings moulded to legs down to the black shoes with gold coloured strand bow buckles, standing upon trademark Vichy yellow textured damask moulded square base, thumb-grip key and start/stop to left-hand side. 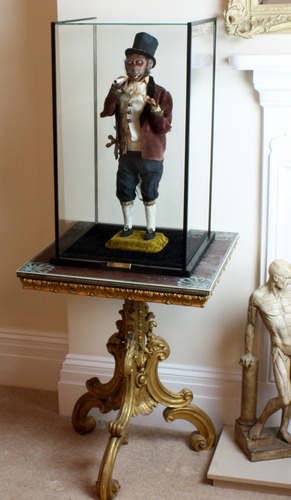 Standing within very smart museum-grade glazed pedestal cabinet with ebonised U frames to sides, ebonised baseboard, bearing rectangular engraved brass plaque for maker and date. Automata - The Golden Age, C. Bailly, p.81 for the black gentleman version, same date, with identical movement. 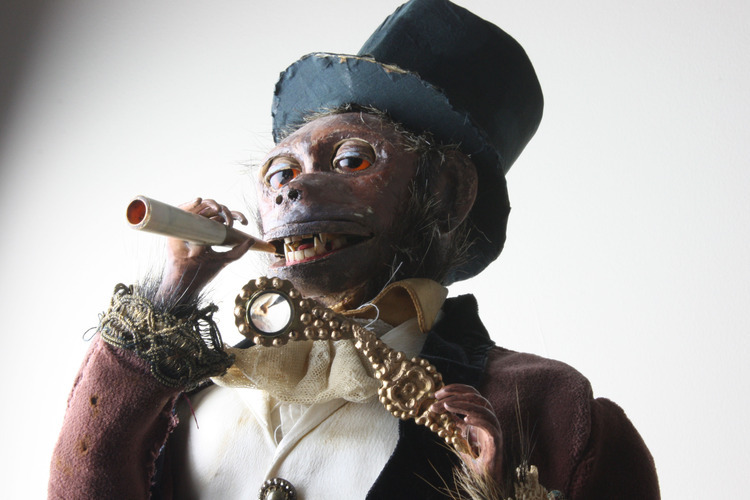 One of the earliest surviving examples of a smoking automaton, this very rare monkey model is performing as strongly today as when he first started his habit over 140 years ago. 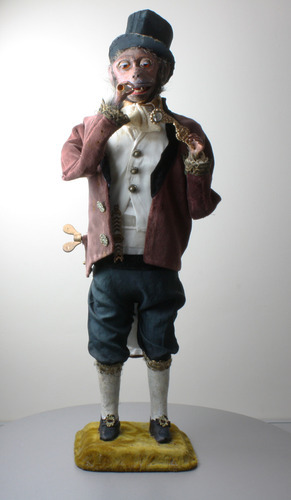 This smooth-action automaton has so many naturalistic features to each movement, it really is like witnessing a heart-beating individual performing. The head movements are particularly convincing, although, with all automata, the mass of the sum of all parts produces the magic with the strength to impress. And Vichy here got it absolutely spot on. The cams on this have been cut and shaped as to allow soft and hard expression, fast and slow phrases of action which are in the realms of perfection. The little touches, such as the strong lens in the panz-nez magnifying his eye to the viewer once held close to his face is a true visual delight. 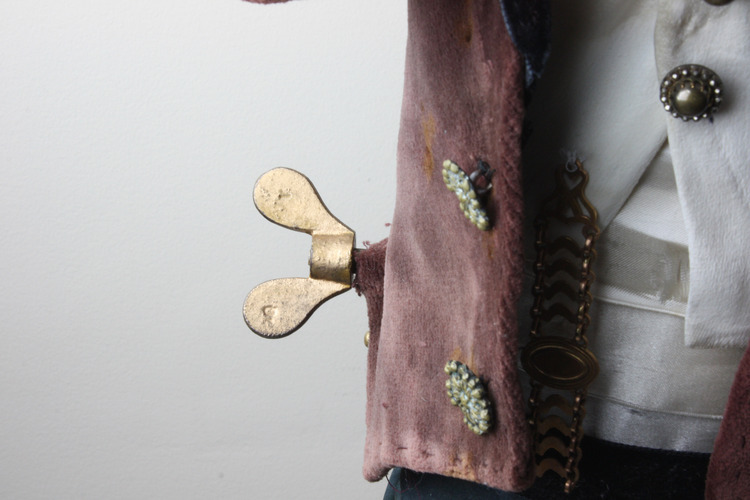 Those who have seen a snake charmer automaton may relate well to this level of attention to detail. 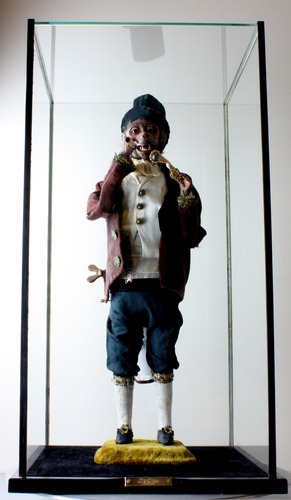 His smoking pattern is made possible by the continual input of cigarette smoke into his bellows, or lungs, and the passages of exhaling in either smooth and slow or fast and pulsed. 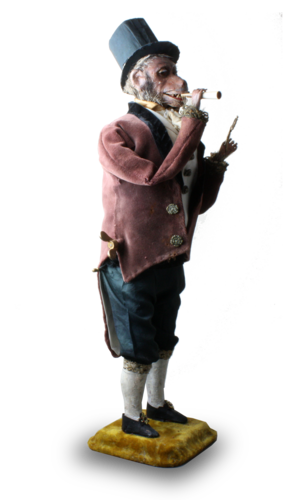 Very effective when the air around is still or he is performing in the centre of the room so that the cloud issuing can enrobe the automaton. 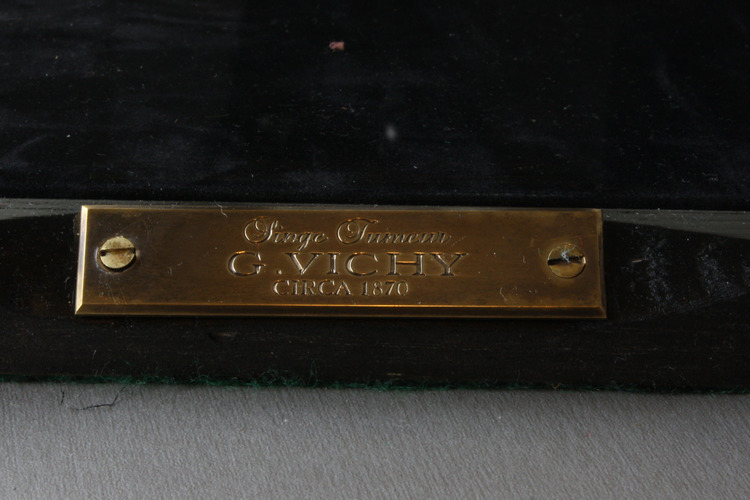 This piece by Vichy from 1870 or just after is one of the most impressive examples to survive and to be offered in recent years.